How Far is Anjaneyaa Madambakkam? 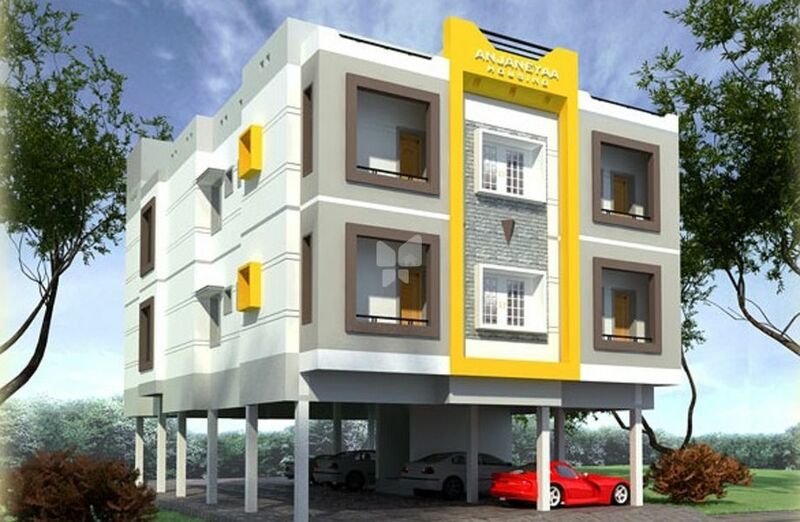 Anjaneyaa Madambakkam is a residential development of Anjaneyaa Housing in Madambakkam, Chennai. It is a multi-storied building offering 2BHK apartments that spread over a built-up area of 936 sq. ft. and 3BHK apartments that spread over a built-up area of 1164 sq. ft. The project is well equipped with all kinds of modern amenities and basic facilities. R.C.C columns and beams, Brickwork with good quality chamber bricks. Main door by solid teak wood frame and polished teak wood shutter. Other doors with country-wood frame with flush shutters. Country-wood frames and shutters glazed. Ceramic tile flooring, glazed dado upto 7'0" height. Parryware plumbing accessories and wall mixers. Kitchen platform with black granite and stainless steel sink. 2'0" Height glazed Dado. Concealed copper wiring with neccessary light points of 5 amp plug points, T.V and Telephone points. One 15 amp point for A/C & Geyser. Wiring Provision for invertor. Concealed copper wiring with neccessary light points of 5 amp plug points, Water supply through borewell. Underground water sump for govt water supply & RWH. Over-head tank shall be provided. Emulsion paint for internal and external walls, Enamel paints for doors and windows. Main Door and All windows are provided with safety grills. Car Parking, Cost of Registration, 3-phase EB connection, Property tax assessment to borne by the parties. ANJANEYAA Housing is committed to provide better and customized homes. International standards of house construction, real estate, in-house research and development, in-house design, on time delivery and transparency in dealings. In time to come, ANJANEYAA Housing will continue its pursuit for excellence in the real estate sector. Construction of customized homes of stately grandeur in chennai is our endeavor. We strive to aid our consumers in their quest for highest quality living by developing properties that do not compromise their lifestyle choices in any way. We do this by ensuring that these properties are of the highest quality without endangering the environmental fabric of the areas they are built-in. Our philosophy is high quality, integrity, value for money and a great deal of emphasis on providing the customer with a smooth, rewarding experience. It is always our aim to offer support, respect and a professional service they can be proud of. Each project is treated carefully on an individual basis and every client can be assured of a quality service. At ANJANEYAA Housing, we bring together a diversity of professionals and builders in residential, customized home design, building and construction. Our real estate specialists are dedicated to providing custom-tailored solutions and high standards of advice. ANJANEYAA Housing benefit particularly from our expertise as we can provide solutions to very challenging problems.